We’re more than half way through the season, and sitting pretty. Nine games to go and who knows what the future holds? One thing we do know for sure though is that this year’s blend of old and new Swans is proving to the footy world that the mighty Bloods are on the right track. This is nothing new! We’ve been on the right track for years now: over 22 of them in fact, since 1996, and we have the club to thank for that. The Sydney Swans Football Club has been remarkable, and not just for the past two decades. Ever since the powers that be dumped us in Sydney, our club has stood tall. It has faced many challenges since those days, back in the early ’80s, none more so than trying to build a competitive team that would attract interest in a rugby league-loving environment. Challenges too in trying to convince South Melbourne diehards to continue carrying the flag from one state to the other. That was really difficult for Bloods supporters; some simply couldn’t cope, and left the club. For me, and thousands of others however, there was no choice. We were still the Swans and we were still red and white. That was certainly better than not having a team at all, and there was absolutely no way in the world that I could have supported another club. Red and white was in my blood. So, the ’80s were tumultuous years for my beloved team. After some success in ’86 and ’87, although no finals wins, we slumped the following year and were in massive debt. By the end of the year, ownership of the club was in the hands of a group of Swans financial investors. 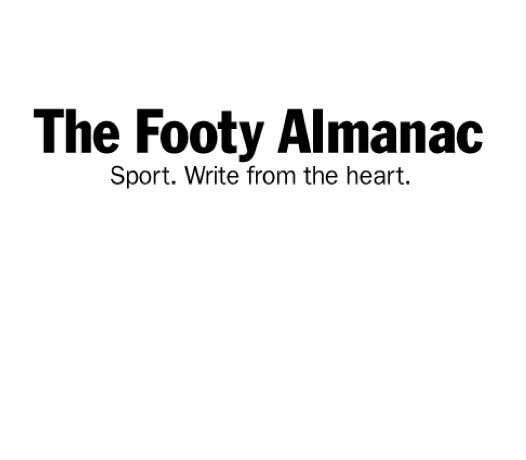 Our worst years, 1991, 1992 and 1993, when we were wooden spooners, saw the AFL becoming involved, contributing enough dollars to enable the team to keep playing, and it was mutually agreed that the club would revert to a traditional member-based system rather than continuing with private ownership. The great Ron Barassi was appointed coach in 1994 and Richard Colless (often referred to as our saviour), became our new chairman. It appeared that we were on the right path. By 1995, when Paul Roos and Tony Lockett had joined the team, and our champ Paul Kelly won the Brownlow, we all dared to hope. Despite finishing 12th on the ladder that year, we could never have imagined, in any shape or form, just what 1996 had in store for us! Our first grand final since 1945! And look where we are now! So, a mighty thank you to everyone at the footy club: all past and present, including the Board, the CEO, the managers, the development staff, the coaches, the trainers, the doctors, the physios, the psychologists, the analysts, the strategists, the accountants, the media and public relations people, the Swans Foundation crew, the Melbourne Swans staff, the Swans Academy, and especially to the very best recruiting team in the business, headed by the indomitable Kinnear Beatson. We would not have had the sustained success we’ve had these past 22 years without these devoted people and the players who’ve proudly donned the red and the white. And we certainly wouldn’t be boasting a membership of over 60,000 had the entire club not worked their butts off to get to where we are today. And now, back to the present, and the players themselves. Our boys have been wonderful. All of them, young and old. Every single one of them has contributed to our current position on the ladder. Macca gets my first mention: he has been superb, and surely we will see him marshalling his back-line troops in 2019. I certainly hope so. Our leaders and experienced guys, Joey, Parks, Buddy, Kizza, Hanners, Ramps, Reg, and Smithy have been wonderful; Sincs, under dire circumstances when Sam Naismith went down injured and Tippo retired, has played beyond expectation and excelled in the ruck and forward line; Lloydy has been exceptional again this year; Georgie has been unrelenting in his new role as tagger; Heens, Harry, Paps and Zac have been excellent; Gazza, after a tough time, has shown just what he is capable of; Marshy is fitting in well with our back-line heroes; Aliir is certainly back; Millsy was great until he fell over; and Deano, Robbo, Newie and Foxy have all played their part and will hopefully get more senior footy time. And now, our young kids. The adjectives could flow and flow, but it is surely sufficient just to praise them. Every year we blood new players, and every year they blend in just beautifully. I don’t think we could have imagined a year ago that the likes of Ollie, Ronks, Will, Tommy McCartin and Ryley Stoddart would have played so well and been such an integral part of our team in the matches they have played. And those young guys running around in the reserves, racking up the numbers and impressing our former champ and now our NEAFL coach, Tadhg, also deserve a mention. I have been to all the NEAFL games played in Sydney this year, and Colin O’Riordan has been exceptional in every one. So too has Darcy Cameron: what a wonderful support for our ruck stocks he will be (hoping that Callum just keeps going and going), and James Rose is getting better and better. And, our hero, AJ: if only he could get just one more senior game! Now, we just need Reidy and the Pelican back, and we’ll be on our way! Having said that, I’m in the coach’s corner when talking of the future. One game at a time is my mantra. The remaining nine games will be tough. As tough as they get. We will play eight of them against the current top 10 teams – 11 if you include Essendon. And talking of tough, the Swans (along with Adelaide) were allocated the most difficult draw of the year. Of the 22 matches, we were looking at 16 of them against the top 12 teams. The lowest number belongs to Hawthorn and North – both 12, with the other teams ranging from 13 to 15. But, we are the Mighty Bloods, and we all know just what we can do. So, until our next big game against the Tigers, let’s rejoice in our year so far, look forward to the next nine games, and hope. And, how nice it would be if, in September, we could all join in with the loudest and proudest rendition of Cheer Cheer that has ever been heard since 1874! What a praise so warmly written, Jan, in awe of all these people who have stood up and created and are still creating this most special club in the afl!! i feel your passion and praise of all the people you have written about. i feel your enthusiasm in your story. go Jan!! great story of human endeavour and resilience. thanks for your inspiration. your story gives me more courage to always be resilient in my own life to stand up and be strong and do what i most truly love.